Hire Toyota Innova Taxi in Mangalore and Udupi at reasonable price from Mangalore Taxi for Outstation trips, Airport transfer and Local sight seeing usage ( 8 hours and more). 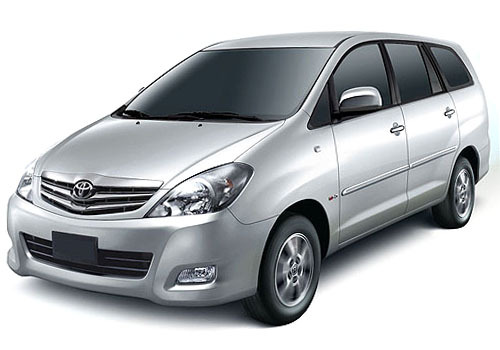 Rent Mangalore Taxi’s good condition Toyota Innova in Mangalore. Hire Toyota Innova on point-to-point distance charge. If you want to rent Toyota Innova Taxi Van, which comes in 7 and 6 seaters or to know more details regarding the tour fare and tariff, please contact Mr Mr Kusumakar at +91-9972722878. The Innova brings together qualities never before seen together in an automobile. The Innova successfully holds eight people inside, and the attention of all others outside. It includes: air vents for every row, independent air conditioner, wood grained instrument panel, versatile seating, enough space for passengers and luggage for a weekend trip, 2 din Audio System with CD and MP3, adjustable driver’s and passenger’s seat and many more. Manufacturer: Toyota Kirloskar Motors Ltd. This entry was posted in SUV's & MUV's, Taxi and tagged 8 seaters, book taxi, Car rental, city taxi, innova car rent, innova taxi, Mangalore, mangalore car rent, mangalore car rental, mangalore taxi, online taxi, taxi mangalore, toyota innova rent, toyota innova taxi. Bookmark the permalink.